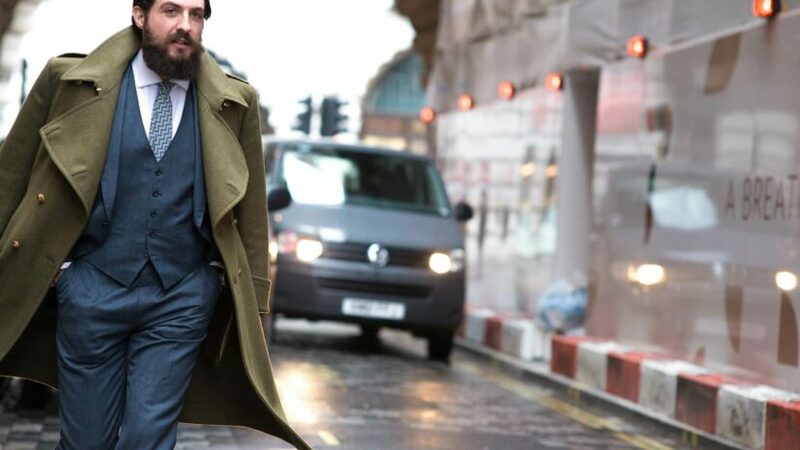 The number of overcoat styles available can be a bit overwhelming when trying to narrow your personal choice, so we’ve put together this handy guide to the overcoats we are most commonly asked to make. Trench Coat – A timeless classic invented in the trenches of WWI, much coveted by the serving soldiers for its warmth, weather protection and ease of mobility that it allowed. Having evolved into the more common raincoat incarnation that we know it as today, a double breasted front, single back vent, raglan sleeves and epaulets are the style features that make this coat so distinguishable. Covert Coat- Lighter than a classic overcoat, these are favoured by our younger clients for a contemporary look when worn over work suits or dressed down with jeans or trousers for a more casual feel. Initially designed for hunting, covert cloth is a light twill which makes it suitable for wear in most weathers and seasons and it is this cloth that gave the coat its name. Sturdy and durable and in its most genuine form, the Covert has quadrupled stitching, designed to reinforce it from the elements. For those more shifty in nature, an inside poacher’s pocket, large enough to store a vanquished pheasant until dinner time, is also a feature of the original design. The Crombie- A staple of British tailoring, the Crombie takes its name from the Crombie company, by John Crombie who was originally a cloth producer, in 1805. Usually made with concealed buttons and a velvet contrasting top collar, the Crombie is classic in its style, giving it the ability to outlast fashions that come and go. It has a versatility that works with a variety of looks, previously having been associated with City bankers, Mods and Skinheads. The Chesterfield – Synonymous with high society, this most elegant of overcoats was conceived in the early twentieth century to replace the Overfrock, a highly-tapered overcoat dating back to the Victorian age. Named after the Earl of Chesterfield, this style was part of a move toward a fashion for less restrictive clothing, which also included lounge suits. Easing restriction to the waist area was fundamental and is why the Chesterfield rarely has horizontal seams or sidebodies. This style, though most popular in the 1920s, is still commonly worn today. The Greatcoat – Also known as a Watchcoat, this is a heavyweight among overcoats, and derives from military wear. Made from the most robust of wool cloths and embellished with military buttons, its characteristic flared out shape allows lots of leg movement which would have been necessary for the battlefield. Wear fully buttoned for a more formal look or open for a more casual approach. Collars up and cuffs out ensure the ultimate in wind and rain protection.